There is no direct relationship between private demand and private debt ratios. Households and businesses incur debt for many reasons other than expenditure on currently produced goods and services. The large majority of debt is incurred to finance changes in ownership of existing assets, not for spending that contributes to GDP. Over longer periods, changes in interest payments are also a major factor in the evolution of debt ratios, and again do not contribute to demand. The denominator also matters. Faster growth and higher inflation reduce debt ratios, slower growth and lower inflation reduce them. Shifts in inflation have historically played a much larger role in changing debt ratios than have changes in current spending. With higher inflation — which is certainly possible — it is entirely possible for rising private demand to be associated with falling debt ratios. Your claim that faster growth of private demand necessarily implies rising private debt ratios has no basis either in economic principle or in the historic record. You need to stop saying this. The issues you highlight are important. Obviously inflation and interest rates are important variables in the determination of the debt-to-income ratios and historically have played some role in the increase of the debt-to-income ratios of the private sector. Note that we are not saying that faster growth in private demand necessarily implies higher debt ratios; we say it does given the current conditions (inflation, income inequality, etc). The case you make is more convincing for the corporate sector ; where there is evidence that there has been a decoupling of investment decisions from cash flows (as you show in your recent paper). 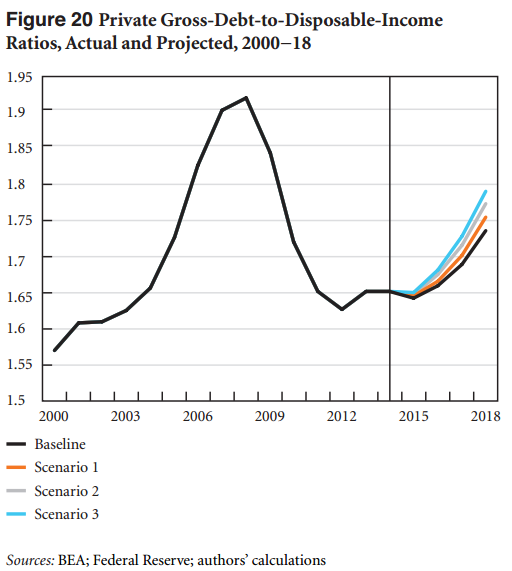 However, to produce our simulations we assume that the corporate sector will continue borrowing in the same way it has been doing since 2010, so it is not a change in the behavior of the firms that leads to reversal in the debt-to-income ratios of the private sector. Where did the borrowing [of the middle class] go? Some have asserted that it went to invest in stocks [this is what you claim]. However, if this were the case, then stocks as a share of total assets would have increased over this period, which it did not (…) Moreover, they did not go into other assets. In fact, the rise in housing prices almost fully explains the increase in the net worth of the middle class (…) Instead, it appears that middle class households, experiencing stagnating incomes, expanded their debt in order to finance normal consumption expenditures. In our Strategic Analysis last year we provide further evidence towards that direction (see pages 5-10). Would the situation have been different if inflation was higher, or if the interest rates had not increased in the early 1980s? Most probably it would have (especially if we ignore the complications of inflation on the foreign position of the economy). At the same time, given the current situation the only way for consumption and private expenditure to pick up is for households to start borrowing again and to increase their debt-to-income ratios. This is based both on economic principle and historical record and we will obviously keep saying it. The flip side of the auto sales story is home sales / construction. All we need is another tidal wave of liar’s loans , and this economy will perk right up , for a while. 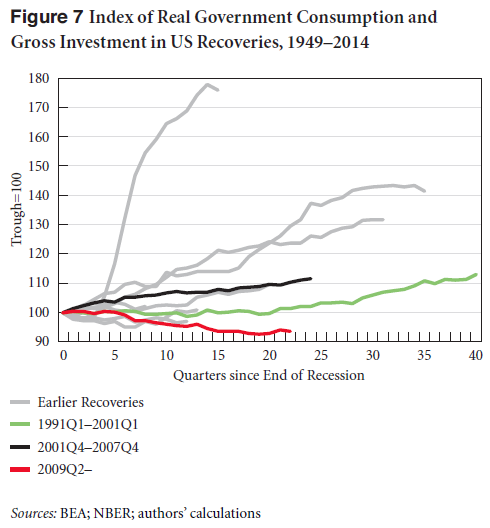 BTW , it’s fine to be anti-austerity and all , but it would be nice if progressive economists would occasionally point out that one debt- and deficit-free path to stronger growth runs through a reduction in income inequality , which could be even more effective if combined with gov’t stimulus financed via top-1% wealth taxes. The Republicans don’t stop promoting their wish lists just because the political climate isn’t perfect. Look at the “Death Tax” ( and look quick , because it might disappear at any moment ).